About eleven years ago, I went abroad to be with my OFW husband as a dependent. I was 4 months pregnant with our first child then and didn't really plan on applying for work. A friend told me that I should learn some valuable skills which I can use to make money part-time or at least just to keep myself busy and not get bored in the house. You see, where I am, I literally just stay in the house when my husband is at work. I only get to go out when with him. Anyway, I didn't do any part-time work until recently when I started doing online freelance writing and some virtual assistant jobs. 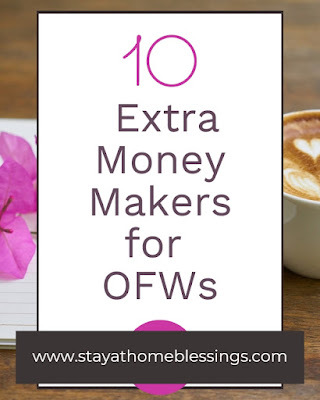 But let me share with you my list of 10 extra money makers that OFWs or their dependents are doing here, in the Middle East, part-time or even full time. This is just based on my observation and personal opinion. 5. Hair and Beauty services - If you have some haircutting skills and other beauty care services like manicure, pedicure, etc, you can earn from this skill too. Income from haircut is usually 25-50 sr per person. 6. Sewing customized clothing - If you know how to sew, this can also be a good way to earn. Many parents like the school uniforms of their children to be custom fit. When schools have special programs, parents look for someone to sew their children's costumes. Income: custom sewing excluding cloth minimum is 20-30 sr per piece. 7. Selling cooked food or baked goodies - This is what many housekeepers and even nurses do. They pack cooked viands and snacks and sell them. Others bake cakes on a per order basis. I know a family who cooks siopao and sells them in schools and bakeries. There are also others who do catering for gatherings and earn a lot more. 8. Selling load, gold and other stuff - You thought that selling e-load is only popular in the Philippines. There are also those who sell mobile load here and earn some. Some housewives get a chance to sell gold and jewelries and get commission on sales. 9. Blogging - I've noticed from blog hopping that there are many expats who blog. Some do it just as a hobby but in time they also get to earn some. 10. VA Jobs - This is what I do now to earn from home. I accept some VA jobs as my time allows. I have created profiles on oDesk Upwork and Freelancer.com and sometimes I get invited by employers to do some work. Other times, I bid on jobs and get accepted. There are many ways of earning. If a person can only pinpoint and see what talents or skills he has, he can earn some extra cash. This is a good share Chin! I only get to know about the Middle East scenario for OFW's in your blog. It's nice to know that other OFW's are engaging on such part time works to augment their income. Filipinos are really very well known for being hard working and patient and this makes us stand out from the rest. Thanks Krizza. I agree with you that Filipinos are hardworking. Wherever they go, they would try to earn extra especially for the sake of family. I am not at all surprised that blogging is in as one of the many ways to augment Filipino's income. Since I started out blogging in 2007, andami talagang WAHMS na nakakapag-earn through their blogs. It does for me too though I am no WAHM. I have a regular day time job but I also get to blog when I am at home and derive some income for doing so. Good luck in Sheryl's contest. Bumalik na pala ang meme with a twist ;-) Haven't been around much. Thanks for the visit and comment at my blog, Chin. Lainy, I agree that many, not just WAHMS, are using blogging as an additional source of income. Well, it's better use of time and the internet than just playing games online. Thanks Lainy for the visit, too. great list chin. as usual, a well-researched article from you. nice one! anyway, thanks for joining the Techie She Weekly giveaways. good luck and regards!